With so many pain treatments available, why do millions still struggle with pain? You don’t have to live crippled by chronic or acute pain. You can actually STOP both chronic and acute pain naturally without surgery, drugs or physical therapy. Where is your pain located? Sciatica, neck, general nerve, sports injury, lower back, headache, limbs? 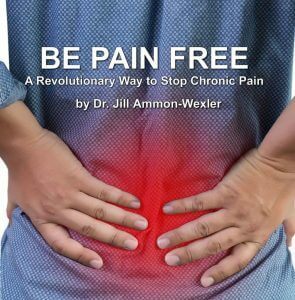 Dr. Ammon-Wexler has for years worked with people with both chronic and acute pain. Her methods have helped people reclaim their active, pain free lives using natural pain control approaches. This method has an astounding 48-year success rate. The key is a unique collection of spoken audios that help you teach your nervous system HOW to control any pain — chronic lower back, hip, sciatica, and even post-injury pain. This remarkable CD will surprise you. WHY? The real secret to chronic and acute pain is to calm your nervous system. These audios do just that – quiet your central nervous system and help you get control of your pain and get your active life back. Dr. Ammon-Wexler’s answer to pain reflects the latest in neuroscience research. Why? As a neuroscientist, she knows how your brain processes both mental and physical pain. This CD collection contains engineered spoken relaxation exercises that train your brain to be pain free. Audio 1. Melting Pain Away. Popular guided relaxation with pain reduction and healing suggestions. Control pain and listen to Alpha/Theta brainwaves. Earphones recommended. Reduce pain-related motion during sleep. Less restlessness equals better sleep. Earphones recommended. Audio 4. Out of Pain. Reduce pain to a manageable level. Earphones recommended. Audio 5. Quiet a Restless Mind. Does not put you to sleep, but simply calms you.